Michel Hooper-Immins, at Hardyes School from 1958 to 1965, wrote the story of the Hardyeans Club and their predecessors the Old Grammarians, on their centenary. Exactly a hundred years ago this evening, "a large company of old boys" of Dorchester Grammar School met for dinner at the King’s Arms Hotel. It’s certain many Old Grammarians working and trading in Dorchester, would already have known each other. That evening they agreed the association of old boys be formalised as the Old Grammarians, the beginning of a hundred year link with three successive schools in the county town. In the times of Queen Elizabeth I, it was Thomas Hardye [with a final "e"] described as an yeoman of Frampton, who endowed Dorchester Grammar School in 1569. Hardye’s [shopping] Arcade today stands on the site. The Grammar School moved to Culliford Road in 1928 - renamed Hardye’s School from 1954. The new Thomas Hardye School in Queens Avenue opened in 1992, encompassing the best traditions of the two previous schools - but admitting girls for the first time since 1569! 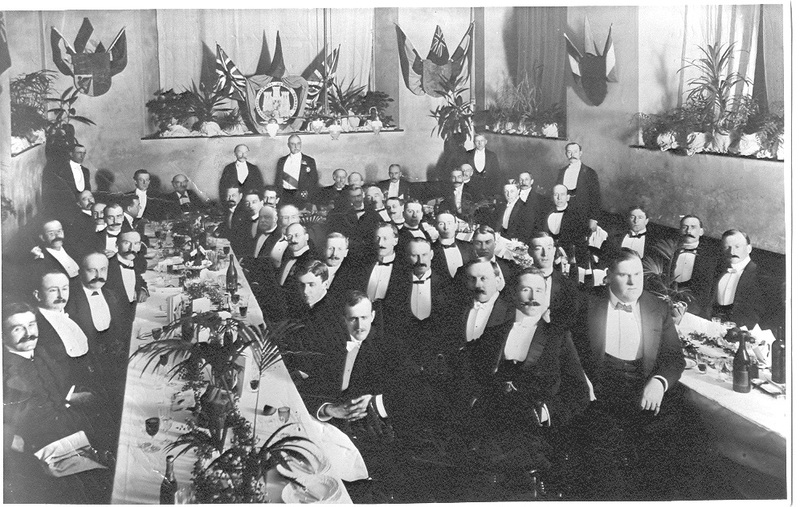 A photograph thought to be of the November 1910 dinner in the splendid Casterbridge Room of the King’s Arms Hotel, shows Thomas Hardy OM and Sir Frederick Treves GCVO both under the borough coat of arms. No ladies are present and all the guests wear identical stiff shirts and bow ties! Some wrongly assume the writer Thomas Hardy studied at Dorchester Grammar School and the schools were named after him. In fact, like Sir Frederick Treves, he had been a pupil of dialect poet William Barnes. However, Hardy became a governor and laid the foundation stone of the new Dorchester Grammar School on 21 July 1927. His Max Gate home was close by. Tragically, all early records of the old boys association have disappeared, but by diligently researching the Dorset County Chronicle at the Record Office, Colin Lucas discovered a full account of that 1905 dinner from the next day’s edition of 2 November 1905. "A large company of old boys gathered to recall old memories, to revive the charm of tender associations and to rekindle the flame of devotion to the alma mater," they reported. The chairman was Napier Kingdon, headmaster from 1882 until 1895, the first after the Grammar School in South Street was rebuilt. The top table included Lieutenant Colonel J. F. Hodges - a school governor, Arthur Symonds - town clerk of Dorchester & clerk to the school governors and S. A. Rootham- the current headmaster. The handsome menu card was tied with black and blue ribbons, the school colours. After dinner, in the patriotic mood of the day, Napier Kingdon reminded the old boys of "the immemorial reputation of the citizens of Dorchester for loyalty and how the affection and devotion which the late Queen Victoria drew to herself, were being evoked by her son Edward, who was treading so admirably in her footsteps." The school magazine, "The Durnovarian," on its first appearance in 1901, asked to hear of old boys fighting in the Boer War. The evening ended with Old Lang Syne and God Save The King. Earlier in the evening, diners sang William Barnes’ "Praise o’Dorset," to music by Boyton Smith. There had been a dinner in 1904, convened by Dr Walter Lock, Warden of Keble College, Oxford, a distinguished Old Grammarian. It was agreed to hold the dinner annually and the Old Grammarians association was formalised at the next year’s function on 1 November 1905. Monty Hellier became the first Hon Secretary. Wilfred Hodges JP organised many of the subsequent dinners and served the Old Grammarians until his death in the 1950s. Nonagenarian George Foley from Royston in Hertfordshire is the club’s oldest member. He began at Dorchester Grammar School in South Street from 1925 and transferred to the new school in 1929. Although now officially called the Hardyeans Club, many of us still speak of Old Hardyeans and Old Grammarians. The name change in the 1990s was intended to reflect the claim that not all Old Hardyeans are old! Dr Ian Melvin OBE, headmaster of Thomas Hardye School, values the old boys. "Old Hardyeans continue to play a crucial role in the school," he says, "obviously they offer an important sense of continuity, but also their experience, contacts and vital financial support of sixth-form students through bursaries cannot be overestimated." One constant figure in the modern Hardyeans Club is dynamic Colin Lucas, mayor of Dorchester in 1980 and 1984, a town, borough and county councillor with many years of public service. A retired insurance broker, he joined Hardye’s School in 1946. In March this year he retired as secretary of the Hardyeans Club, the pivotal organiser of events since 1996. 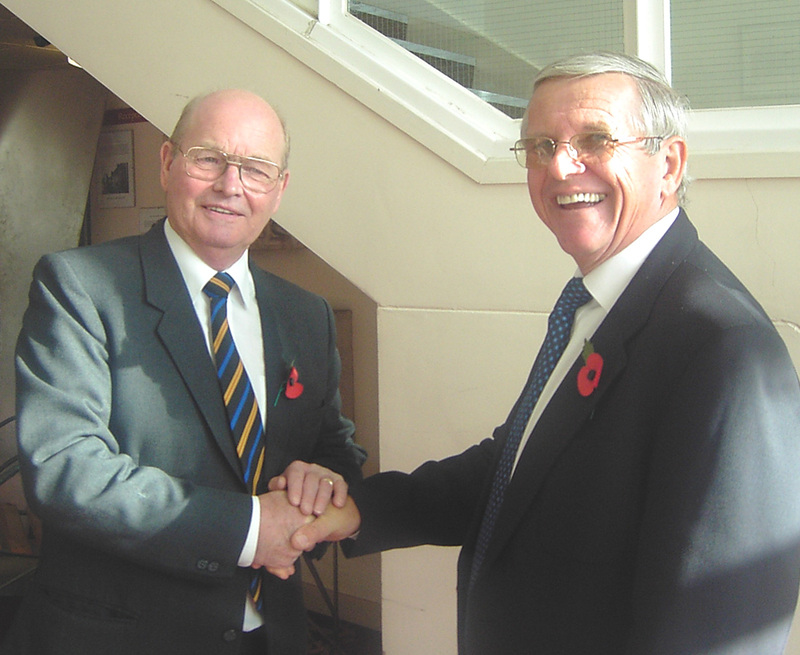 "Colin Lucas has served as school governor as well as president, chairman and secretary of the Hardyeans Club," president John Pearson told the annual general meeting, "Colin’s whole life is dedicated to Dorchester. He’s the lynch pin around which the club has revolved." After many more fulsome tributes, Colin Lucas was presented with two silver decanters and two bottles with which to fill them! Retired police chief superintendent Tony Day, clerk to the governors at Thomas Hardye School, was elected the new secretary of the Hardyeans Club. Treasurer Ken Pearce has moved away and with no replacement, Colin Lucas continues temporarily to look after the finances. Terry Stone, an Old Hardyean retired to St. Kitts Nevis, created the informative and interesting website www.hardyeansclub.com which even contains a list of all those at the School from 1924 to date. The informative club newsletter, published three times a year, is edited by Peter and Heather Foster. A highlight of the year is the act of remembrance every 11 November. On Friday week, all 2,400 students and staff of the Thomas Hardye School will stand in silent tribute before the memorial gates, honouring those scholars who gave their lives in war. Many Hardyeans attend the commemoration and are entertained to tea afterwards by the headmaster. Thomas Hardye School is the only school in Dorset - and probably anywhere in the South West - to maintain this respectful tradition, inherited from the school in Culliford Road.